When Twitter recently launched their first Tweet tool, which hunts down and displays your first tweet for you, I had to check it out. 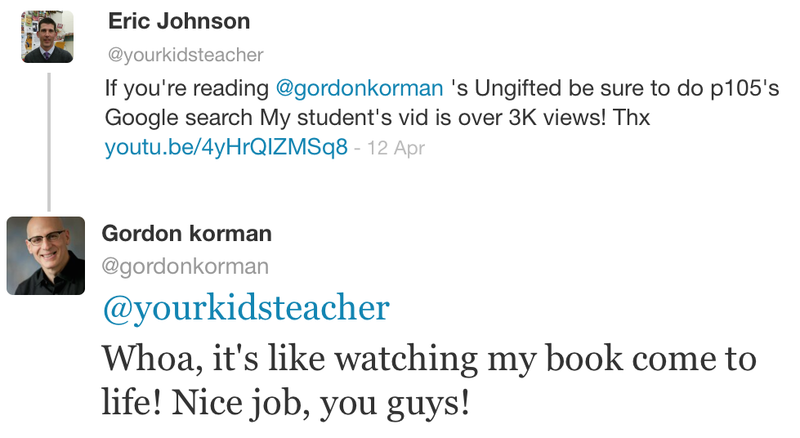 'YourKidsTeacher' tweet #1 was a good indicator of why I decided to use Twitter in my then 1st grade classroom. I’ve been on Twitter as @YourKidsTeacher for a little over 4yrs now and as my Tweet count approach five figures, I looked back at my timeline and saw how the nature of what I share has changed. Back then, I shared what we were doing at a couple of points in our day, classroom/school information, reminders, etc. Twitter was a great place to share the good things going on. I shared the learning joy of first graders. It wasn’t until much later, when I started participating in #chats and had ‘conversations’ with other educators from all over the world, that my tweets evolved from their original mission. My current usage is not exclusively about the things going on in our classroom. I ‘talk’ to a lot of different people now, moderate a chats from time to time for areas in which I have something to offer. There is a lot more of ‘me’ in my timeline. The evolution required a change in my profile descriptors and an statement of an unapologetic fashion faux-pas. Nobody needs to see my toes. The school year resembles the path of a roller coaster. I share the good on Twitter. My kids, school, and grade level achieve some great things. Their efforts and accomplishments deserved to be shared. I’m proud for their efforts. I share the ups, the peaks, the high points. I share the things that get me excited. I tweet when a kid does a great thing, when our school makes the news for a feel good story, or when I leave school feeling awesome. Like on the day when one of my kid's favorite authors tweeted back that he loved what one of them had created. I’m not as good as the Twitter me. However, you won’t see me tweet about bad days, bad lessons, or bad experiences. I think there are enough people writing stories about real and perceived failures in schools. I’m not about to contribute 140 characters to that narrative. My Twitter miranda: I won’t provide any evidence that can be used against me and my peers. People fail at their jobs everyday. Me too. I fall down all the time. Sometimes my organizational skills fall apart and I can’t keep up with all my clubs, teams, home partner communications, committees, and other clerical tasks. The non teaching stuff of being a teacher can be overwhelming. Frustrating. Sometimes I don't give a lesson on indirect objects the full weight and force of my teaching skills. There are times that my lessons go down in flames the minute I lift them off my table. Days that I feel like crying or screaming. There are numerous days that I feel Quixotic. Ineffective. I just won't tweet those things out. I blog about those failures sometimes. I think I have a responsibility as an educator to talk about my missteps. Writing about those times helps me reflect. When I read my favorite writers, I realize I’m not the only one who might have had a bad day. Sometimes re-realizing that there are other educators out there who crashed, burned or failed yet again to tip over the windmill helps other teachers. Many of us struggle reaching our own expectations. I like to read about those instances, but I like stories that are longer than 140 characters. If you want to think further about sharing the failures and such in your classroom, read this great post by Michelle Baldwin and then scroll down to see the comments by Dean Shareski and their conversation. A couple of my favorite virtual colleagues. I value their insights and conversations a great deal. Thank you Eric for your transparency and honesty. We are all works in progress if we are doing our jobs as teachers correctly. I particularly appreciate your Miranda that limits the negative in order to give rise to the positives in your experiences. On another note, wish I could have talked with you at #pcscequip2013, it was a great conference with so many #eduheroes in one place. See you in the Twitterverse. Thanks Will! Like most of my good ideas, my Miranda bit, came to me on a bicycle training ride. I get a good one once in a while. eQuip was a great conference wasn't it?! I'll be attending a couple of IN conferences this Summer ('14), maybe we will cross paths. It would be great to meet you as well. Will look forward to that. Seems like Indiana is the place to be. I have met so many great teachers via Twitter/pcscequip from that state. Their excitement for education is contagious. In the meantime I will read some more of your thoughtful postings. I have a blog post that I have yet to publish, simply because I'm too busy with reporting and teaching right now... but it's coming. I feel like the post will be somewhat confessional, but definitely a risk in putting myself out there, too. What if we're ok with "Twitter Me" (Twitter Us?) being better than our real selves? What if we choose to share really good things because there's so much other garbage out there - and WE are providing the balance between good and awful every day? You're right Michelle, maybe by putting out more of the good stuff we ARE providing balance to all of the "ick" stuff being put out there by those trying to steer the educational narrative in the wrong direction. I really am okay with mostly sharing the good that comes from these kids, because for a lot of them the 7 hours they spend in Room 216 is the best part of their day. They have enough of the 'other stuff' in their lives, I don't need to add to it. Thanks for helping my thinking on this.